In 2000, William Bookout acquired a parcel of property in the Oceano community of San Luis Obispo County (County). He began operating a nursery business on the property shortly thereafter. The property lies at the intersection of Paso Robles and 13th Streets. Highway 1 cuts diagonally across the intersection, cutting through the southwest tip of Bookout's parcel. The California Department of Transportation (Caltrans) owns Highway 1. The Union Pacific Railroad (Railroad) owns land across from Highway 1. The Railroad's predecessor in interest, the Southern Pacific Railroad Company, acquired the land by deed from a private party in 1894. A railroad line on a raised bed was constructed on the property. When it rains, surface water from the surrounding area drains away from Bookout's parcel and into a drainage channel on the Railroad's property. A 24-inch iron pipe conducts the water under the raised rail bed. In 1939 or 1940, the Railroad extended the pipe to go under a second spur added by the Railroad. The Pismo Oceano Vegetable Exchange (Exchange) first leased, then purchased, from the Railroad the property west of the raised rail bed. The iron pipe discharges onto the Exchange's parcel. Around 1977, the Exchange installed a subsurface junction box at the pipe's outfall. 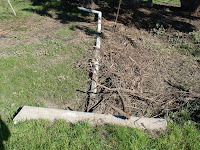 From the junction box, the water is diverted 90 degrees through a second 24-inch pipe to a retaining pond 200 feet away. The junction box is inadequate, causing the water to back up and flood Bookout's property. Bookout on December 20, 2002. 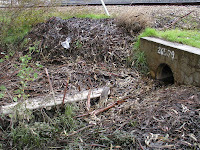 Bookout took a picture of the pipe going into the drainage channel in the aftermath of a rain event in 2002. The picture included a District employee. Caltrans employee, Fred Brebes, testified that before he retired in 2002 he met with Bookout about damage to his property due to flooding. In June 2002, Bookout returned a County questionnaire concerning flooding in Oceano. Bookout stated on the questionnaire that flooding, one foot deep, occurred once a year, and that the flooding damages his inventory. On May 2, 2006, Bookout filed a complaint against Caltrans, the District, the Railroad, the County and the Exchange for inverse condemnation, nuisance, trespass and negligence. Bookout filed a first amended complaint in May 2007. He alleged the flooding ruined his nursery business. Trial on the inverse condemnation cause of action was bifurcated from the other causes of action. Trial was before the court sitting without a jury. During trial, the Exchange entered into a good faith settlement with Bookout. Trial proceeded against the remaining defendants. Bookout claimed he first discovered the flooding in February 2004. His expert engineer, Keith Crowe, testified that six conditions caused the flooding: (1) the pipe under the Railroad's tracks was too small for the conditions; (2) the pipe's capacity was compromised by the Exchange's poorly designed extension; (3) the District's well added silt and debris; (4) the County, Caltrans and the District allowed or caused upstream watershed conditions to worsen; (5) all remaining defendants contributed to a decrease in storage volume at the pipe's inlet; and (6) a lack of maintenance by all defendants. After Bookout completed the presentation of his case, the defendants moved for judgment of nonsuit pursuant to Code of Civil Procedure section 631.8.1 The trial court granted the motion. The trial court determined that the applicable statute of limitations is three years, pursuant to section 338, subdivision (j). The court found Bookout's cause of action for inverse condemnation accrued some time prior to the middle of 2002. Thus the cause of action is barred by the statute of limitations. The court also found Bookout failed to carry his burden of proof that acts or omissions by the District, the County or Caltrans were the cause of the flooding. The court found that the Railroad may have been negligent by failing to enlarge the culvert or requiring that its tenant do so. But the court also found that the Railroad is not a public entity subject to an action for inverse condemnation. After the trial court granted nonsuit on the inverse condemnation cause of action, the defendants moved for judgment on the pleadings for the remaining causes of action. The motion was based on collateral estoppel. A different trial court granted the motion. The trial court relied on the finding in the first phase that Bookout failed to prove causation as to the County, the District and Caltrans. Although the court in the first phase stated the Railroad may have been negligent, the court in the second phase determined that all remaining causes of action against the Railroad were barred by limitations. Bookout contends the trial court applied the wrong statute of limitations. 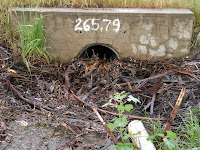 Thus, in Lyles v. State of California (2007) 153 Cal.App.4th 281, 285, the court applied the three-year statute to allegations that plaintiff's property was damaged by a flood caused when a state-owned culvert became blocked. In Lee v. Los Angeles County Metropolitan Transportation Authority (2003) 107 Cal.App.4th 848, 855 (Lee), the court and parties agreed that the three-year statute applied to allegations that plaintiff's property was damaged by the construction of a subway under a neighboring street. In contrast, courts have applied the five-year statute where a public entity has physically entered and exercised dominion and control over some portion of plaintiff's property. Thus, in Frustuck v. City of Fairfax (1963) 212 Cal.App.2d 345, the city entered plaintiff's property, widened a drainage ditch that ran the length of the property and constructed a berm. In Ocean Shore R.R. Co. v. City of Santa Cruz (1961) 198 Cal.App.2d 267, 272, the city constructed a road over plaintiff's property. In Garden Water Corp. v. Fambrough (1966) 245 Cal.App.2d 324, 328, a public entity took possession of plaintiff's water system, supplied water to some 90 residences, maintained the system and retained all income. Here, unlike cases applying the five-year statute, no public entity physically entered Bookout's land or maintained possession and control over any portion of it. The trial court correctly concluded the three-year statute applies. The determination of when the statute of limitations begins to run is a question of fact. (Lee, supra, 107 Cal.App.4th at p. 857.) Here the trial court determined that the date of stabilization theory does not apply. 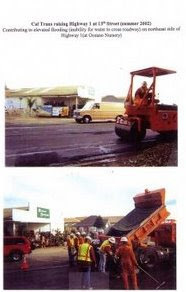 The court found that the last improvements to the drainage system were constructed by the Exchange in the late 1970's, and that the flooding problem was relatively consistent and static for several years prior to the time Bookout purchased his property in 2000.
drainage study questionnaire returned by Bookout in July 2002. Bookout stated on the questionnaire that the area floods one foot or more once a year and that the flooding has damaged his inventory. The County explained that it was unaware of the document at the time of discovery. It said that the questionnaire responses were summarized for inclusion in a drainage study, but they were not filed by name, address or location. The Railroad's counsel happened to find Bookout's response during Crowe's testimony. The County pointed out that Bookout must have been aware of the document because he submitted it to the County. The trial court found the failure to produce the document was not in bad faith, and refused to impose discovery sanctions. Bookout cites Pate v. Channel Lumber Co. (1977) 51 Cal.App.4th 1447, 1455, for the proposition that the trial court has the power to exclude documents that a party has failed to produce in response to discovery requests. But in Pate, the trial court found that the party who failed to produce the requested documents had "'played fast'" with the discovery rules. (Id. at p. 1453.) The trial court found no such bad faith here. Discovery sanctions are reviewed for an abuse of discretion. (Id. at p. 1454.) The trial court did not abuse its discretion. Bookout points to no findings of fact in his favor. Instead, he relies on over 500 photographs and videos showing the flooding, several hundred documents which he claims show each defendant exercised dominion and control over the drainage facilities, and the testimony of his expert engineer, Keith Crow. He believes the evidence against the defendants was overwhelming. Evidence that the remaining defendants contributed to the conditions that caused the flooding rests largely in Crowe's expert testimony. As helpful as expert opinion can be, such testimony carries a built-in bias: experts are most often very well paid for their opinions. The trial court had good reason to be skeptical of Crowe's testimony. We apply the usual rule on appeal that the trier of fact is not required to believe the testimony of any witness, even if uncontradicted. (Sprague v. Equifax, Inc. (1985) 166 Cal.App.3d 1012, 1028.) The evidence presented here did not compel the trial court to find in favor of Bookout. Bookout argues the County may be liable even if it did not cause the flooding. He cites Marin v. City of San Rafael (1980) 111 Cal.App.3d 591, for the proposition that a governmental entity may be liable if it approves a work of improvement. There the city constructed a drainage pipe that extended onto a lot owned by plaintiffs' predecessor. The lot owner obtained a permit to extend the pipe beyond his lot. The city's engineer told him exactly what pipe to lay and how to do it. Later a home was constructed on the buried drainage pipe. Plaintiffs purchased the home without knowledge of the pipe's existence. A few months later the pipe burst during a heavy rain damaging plaintiffs' property. Plaintiffs placed a concrete obstruction in the pipe to prevent further damage. The city obtained an injunction requiring plaintiffs to remove the obstruction and restore the pipe to an operational condition. The trial court found the city was not liable. But Bookout fails to point to anywhere in the record that the trial court applied the reasonableness test instead of strict liability. In any event, the court's ruling was based on the statute of limitations and failure to prove causation. The results are the same under the reasonableness test or strict liability. The defendants prevail. A judgment on the pleadings is similar to a general demurrer. (See 6 Witkin, Cal. Procedure (5th ed. 2008) Proceedings Without Trial, § 187, p. 625.) The factual allegations of the complaint are accepted as true. (Ibid.) The court, however, may grant judgment on the basis of extrinsic matters of which it may take judicial notice. (Ibid.) Bookout does not contest that the trial court may take judicial notice of the court's decision in the first phase of the trial. defendant did not cause harm, there is no causation no matter what the cause of action. The trial court properly granted judgment on the pleadings to the County, the District and Caltrans. The trial court in the second phase did not grant the Railroad judgment on the pleadings based on failure to prove causation. That is because the trial court in the first phase stated, "[A]t most, the Railroad negligently acted by omission by failing to enlarge a culvert or by failing to require (if that was possible) that its tenant do so." Instead, the trial court in the second phase granted the Railroad judgment on the pleadings based on the statute of limitations. Bookout argues the trial court in the second phase erred in basing its judgment on the three-year statute of limitations. (§ 338, subd. (b).) Instead, Bookout contends the flooding constitutes a continuous trespass or nuisance and a new cause of action arises each time it floods. 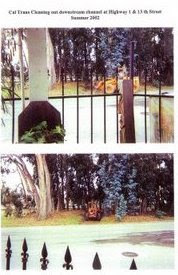 Unlike a locked gate, there is nothing to suggest the pipe is temporary or might be modified at any time. Our Supreme Court has stated, "The cases finding the nuisance complained of to be unquestionably permanent in nature have involved solid structures, such as a building encroaching upon the plaintiff's land . . . ." (Baker v. Burbank-Glendale-Pasadena Airport Authority (1985) 39 Cal.3d 862, 869.) The solid structure here is no less permanent because it is built on a defendant's land. p. 869.) All Mangini was trying to say is that a nuisance can still be continuous even after the offensive conduct has ended. The nuisance or trespass alleged here is permanent. The three-year statute of limitations bars Bookout's causes of action for nuisance and trespass. Belsher & Becker; Belsher, Becker & Roberts, John W. Belsher, Gregory A. Connell for Plaintiff and Appellant. Ronald W. Beals, Chief Counsel, David Gossage, Deputy Chief Counsel, Lucille Baca, Assistant Chief Counsel, Wm. David Sullivan, Derek S. Van Hoften for Defendant and Respondent State of California Department of Transportation. Porter Scott, Terence J. Cassidy, Thomas L. Riordan, Michael William Pott for Defendant and Respondent County of San Luis Obispo. Daner Law Firm, Adam M. Daner for Defendant and Respondent Oceano Community Services District. RE: Statute of Limitations and Prejudicial Error in regards to evidence withheld from discovery by the County of San Luis Obispo Molly Thurmond, Esq. (SBN 104973)Exhibit #579 (Appendix 15) Prejudicial Error or Not? Photo/Statement Documents withheld by County Of San Luis Obispo And Railroad at trial as allowed by Judge Tangeman, as Judge Tangeman Stated "All Right" County of San Luis Obispo Causation in permits and drainage requirements on private property. OCSD and Caltrans correcting 2002 drainage complaint problems in 2002/2003 as stated in exhibit #579 Complaint, Caltrans-McKinley Testomony P. 645 and (RA exhibit #1768) changing the Statute of Limitations! Date of Stabilization! Associate Justice Joyce L. Kennard, Associate Justice Kathryn Mickle Werdegar, Chief Justice Ronald M. George, Associate Justice Ming W. Chin, Associate Justice Marvin R. Baxter, Associate Justice Carol A. Corrigan. Caltrans photos of drainage problems that Caltrans had created on East Side of State Highway 1. Taken after Oceano Community Drainage Study Questionnaire exhibit # 579 withheld from discovery by the County of San Luis Obispo. Why would Caltrans Raise State Highway 1 and not account for drainage or ponding as talked about in Exhibit # 579 Documents that Judge Tangeman would not allow in trial? Statute of Limitations with the Oceano Community Service District; drainage changes in December 2002 (RA Exhibit 1768)and prior as seen in photo exhibits below, with the Oceano Community Service Districts use of this drainage system for discharging 2500 gallons of Well water per minute into this undersized culvert blowing in and cementing debris and silt into this culvert year-around! 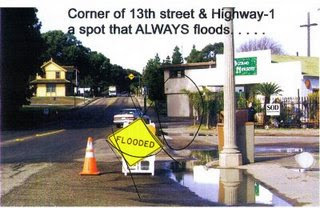 Flooding Photo in 2002 complained about to Caltrans and the Oceano Community Service District. fixed December 20, 2002---Caltrans and OCSD corrected this drainage problem as seen in APPELLANT’S REPLY BRIEF Exhibit # 1768 as stated by OCSD "I had to meet with Bill Bookout and a couple of guys from cal trans about the 6 inch line from well 8 that ends at the culvert by the railroad tracks. I had Dan saw off the 6 inch pipe and end it in front of the culvert so that there will be no danger of the pipe plugging debris at the entrance to the culvert." 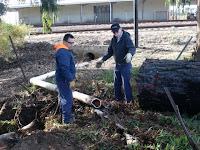 The Next OCSD log of this drainage system is February 9, 2004 before the first flooding of Oceano Nursery. 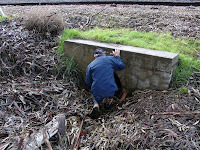 OCSD States: "Then Joe had him cleaning out the drainage ditch by the railroad track down at 13th and Front Street"
Notice Caltrans Drainage change above (Concrete Bag and OCSD Pipe) as seen by Judge Tangeman and local news media per exhibit #579! Judge Tangeman Stated in regards to the video above. "In the case of OCSD, the evidence largely consisted of the construction of the drainage outfall from Well No. 8 in the vicinity of the culvert. While there was evidence of substantial amounts of being discharged from Well No. 8, there was an absence of evidence that such discharges occurred contemporaneously with heavy rains and flooding problems." Please view the video above taken January 13, 2007 talked about by Judge Tangeman! Judge Tangeman August 5, 2008 Decision not looking at evidence and testimony at trial PDF..
Caltrans States at Trial-----Question. Mr. Fry, Exhibit # 1475 on the screen there is the same as Exhibit 11 in your deposition transcript. Can you describe for me the materials that you see here on Highway 1? Hon. Joseph F. De Vanon, Jr.
Hon. Thomas I. McKnew, Jr.
Hon. Mark G. Nelson, Sr.
Hon. Carol H. Rehm, Jr.
Hon. John A. Sutro, Jr.
Hon. Richard W. Stanford, Jr.
Hon. Charles E. Stafford, Jr.
Hon. William C. Gentry, Jr.
Hon. Alvin E. Green, Jr.
Hon. William H. McAdam, Jr.
Hon. William J. McGrath, Jr.
Hon. William R. Nevitt, Jr.
Hon. William J. Murray, Jr.
Hon. F. Clark Sueyres, Jr.
Hon. Raymond J. Davilla, Jr.
Hon. Richard J. Loftus, Jr. Your Honors, This is what Caltrans told the Regional Water Quality Control Board after the Judge Tangeman August 5, 2008 decision regarding the Videos presented to Judge Tangeman. This Statement will have an impact on all of our State Highways. "Due to past litigation, the Department is no longer responsible or allowed to maintain the channel located off of the Caltrans right of way"
moving the flooded water and fallen branches off of the road way. event is over, Department staff return to remove the shoveled material. exacerbates flooding of his property. violation of its NPDES requirements and pursue formal enforcement action.